Sonoma Valley is located just 45 miles north of San Francisco on Highway 12. Bordered by the Mayacamas to the west and the Sonoma Mountains to the east, the 17-mile long valley is one of 12 wine growing regions within the greater Sonoma County area. 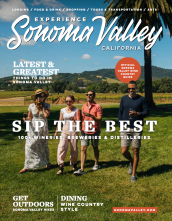 Sonoma Valley begins in the north at the edge of Santa Rosa and extends 17 miles south to the Carneros area, encompassing the city of Sonoma and the villages of Glen Ellen and Kenwood. Sonoma, Boyes Hot Springs, Eldridge, El Verano, Glen Ellen, Kenwood, Vineburg, Schellville and Oakmont. Sonoma Valley is accessible from all Northern California airports, including San Francisco International, Oakland International, Sacramento International Airport and the Sonoma County Airport in Santa Rosa. The climate and geography of the Sonoma Valley make it not only a delightful place to visit year-round, but also one of the world’s great grape-growing regions. Averaging 29 inches of rainfall per year, it is one of the driest areas in Sonoma County. The Mayacamas and Sonoma mountain ranges on either side isolate the Valley, allowing in just enough coastal fog to cool the vineyards on summer nights. The Valley’s geological diversity features numerous microclimates and a variety of soils that enable growers to select the optimal growing conditions for each grape varietal. Sonoma Valley features more than 110 lodging properties ranging from guest cottages, bed and breakfasts and romantic inns to luxury resorts. The birthplace of the California’s wine industry, Sonoma Valley’s first vineyards date back to 1824, planted by Franciscan mission fathers. The region is home to more than 50 wineries, which produce 25 types of wine, totaling five million cases a year. A prime grape growing region with 13,000 acres of premium wine grapes, the valley includes three official wine appellations: Sonoma Valley, Sonoma Mountain and Carneros. More than 40 restaurants are scattered throughout the valley, ranging from casual bakeries and cafes to celebrated chef-owned restaurants. The numerous restaurants offer enticing menus, many comprised exclusively of fresh regional fare. Beyond the delicious cuisine, visitors also enjoy year-round farmers markets and produce stands found throughout the valley, and fare from local artisans and purveyors. The historic Sonoma Plaza provides a fascinating look into early American life, including the former Mexican army barracks, the pristine San Francisco Solano Mission, the site of the Bear Flag Revolt and the home of General Vallejo. The eight-acre Sonoma Plaza, laid out by General Mariano Vallejo in 1835 and the largest plaza of its kind in California, was dedicated as a National Historic Landmark on September 24, 1961. Visual, performing, musical and literary art is abundant in Sonoma Valley. Expressions of Sonoma Valley&apos;s artists can be found in local galleries, restaurants, wineries and retail shops. Sonoma Valley offers 10 galleries, public gardens as well as the Sonoma Valley Museum of Art.